Big, bold, and bloody; director Gareth Evans’ follow-up to the groundbreaking and critically praised first film is every bit the sequel you would hope it to be- and then some. I’ll start this off by saying that I haven’t seen the original The Raid. If we’re being totally honest, I haven’t even seen the Hollywood ‘adaptation’ of the film in Dredd either, a fact that a buddy of mine constantly reminds me I need to amend. It’s not that I don’t want to see either one really, I just never had the chance to sit down and watch them and didn’t go out of my way to do so. So when I sat down in the screening room to view The Raid 2, I kind of had very little idea of what I was about to witness. I say ‘kind of’ because I knew that The Raid 2 was going to be wall to wall action, but I had no idea how incredible that action was going to look on film. When things start off in The Raid 2, it’s not long after the close of the first movie in the series set in Jakarta, Indonesia. Rama, the main character, is undercover (he’s a cop) behind bars and set to infiltrate a gang of city-controlling criminals and politicians. These guys are something akin to Wilson Fisk or Carmine Falcone in the comics world; almost supervillain-level baddies who pull the strings of government officials, police, and everyone in between to forward their own agendas. See, after the events of The Raid, the bad guys caught onto Rama and his family is in jeopardy, hence the reason that the police officer (who really just wants to get out of the game) agrees to go undercover to stop ’em. If you’re rolling your eyes right about now at the plot, you’re not alone. It’s generic and full of devices we’ve seen a dozen or so times before, in piles of action movies from the 80’s through today. 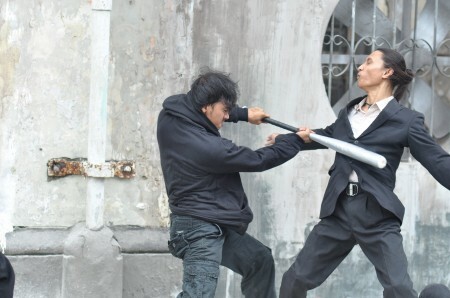 While we’re on the subject, the characters in The Raid 2 are pretty flat for the most part as well. The hero Rama is likable enough and definitely draws a fair mount of empathy for the situation he’s more or less stuck in. Outside of him, one of the main villains, Uco, is fairly memorable… but that’s kind of where the stand-out characters begin and end. You’re not, in any way, going to walk out of a viewing of The Raid 2 and talk about how cool the character were. But, you know what? It doesn’t matter any, because the action almost completely erases that quibble. At times almost feeling like a fighting game akin to Street Fighter or a classic arcade brawler, The Raid 2 isn’t about characterization or incredible dialog, it’s about hard-hitting action and stunning fight scenes. And those, my friends, those you will most definitely be talking about for long after you exit the theaters. There is a story told in The Raid 2 of course, but once the action kicks off at the beginning of the movie, it really never lets up for more than a few minutes. There are lesser scenes through the middle of the film to be sure, but even they are stunners that put other action flicks to shame. With incredible choreography and some of the most violent fighting I’ve ever seen on film, The Raid 2 really couldn’t get much better for a pure action film fan. And just when things start to cool down a little, the crescendo of the film (which runs through three rapid-fire action scenes) cranks things up to 11 in the best ways possible. At times it kind of feels like the action in the main bulk of the movie doesn’t let Rama ‘loose’ completely, but those last three scenes I just mentioned make up for that and then some. To the nth degree. I really can’t say enough about the direction by Gareth Evans here. Although the movie is a little long at two and a half hours, it still goes by at an amazing pace and, as I mentioned, the fight scenes are some of the best I’ve ever seen on film- and I’ve seen a lot. It’s gory and over the top without a doubt, but thats part of the fun and you’ll find yourself ‘ooo-ing’ at impacts and sitting in slack-jawed amazement as gangsters get carved to pieces. Just a note here too- as I watched some of the scenes, I wondered why it is we don’t see some of this kind of fighting in superhero movies. Sure, you’d have to tone down the blood and guts, but wouldn’t a Batman film where the Dark Knight actually uses some of his vaunted martial arts abilities to their maximum potential be something to see? I know I’d love to see it and I think I’d be very happy with Evans as the choice to helm a standalone Batman film (or one from any other martial arts-heavy hero for that matter). Get a solid writer to plot it and Evans to direct the action and you’d have something very different for the genre right there. If you’re an action film fan and you don’t mind some blood and guts (it falls shy of ‘horror movie’ levels, don’t worry), go see The Raid 2. I really can’t put it any plainer than that, because it’s unbelievably good and well worth the price of admission. No, the story isn’t the greatest and the acting isn’t going to win any Oscars (not that they honor actual enjoyable films too often anyway), but The Raid 2 is a must-see from any other angle for action junkies and fans of over the top, super-heroic, comic book-style fare. Don’t miss it.